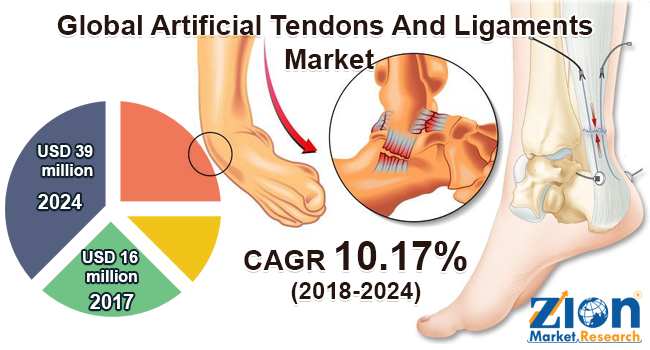 Global artificial tendons and ligaments market expected to generate revenue of around USD 39million by end of 2024, growing at a CAGR of around 10.17% between 2018 and 2024. Tendon and ligament injuries and/or associated disorders are a common problem and one of the leading causes of improper functioning of joint affecting athletes, actively working people, and the geriatric population globally. The report covers forecast and analysis for the artificial tendons and ligaments market on a global and regional level. The study provides historic data from 2015to 2017 along with a forecast from 2018 to 2024 based on revenue (USD Million). The study includes drivers and restraints for the artificial tendons and ligaments market along with the impact they have on the demand over the forecast period. Additionally, the report includes the study of opportunities available in the artificial tendons and ligaments market on a global level. In order to give the users of this report a comprehensive view on the artificial tendons and ligaments market, we have included competitive landscape and analysis of Porter’s Five Forces model in the market. The study encompasses a market attractiveness analysis, where the application and regional segmentation are benchmarked based on their market size, growth rate, and general attractiveness. The report provides company market share analysis in order to give a broader overview of the key players in the market. In addition, the report also covers key strategic developments in the market, including acquisitions & mergers, new product launches, agreements, partnerships, collaborations & joint ventures, research & development, and regional expansion of major participants involved in the market on the global and regional basis. The study provides a decisive view on the artificial tendons and ligaments market by segmenting the market based on application and regions. All the segments have been analyzed based on present and the future trends and the market is estimated from 2018 to 2024. Based on application, the artificial tendons and ligaments market is segmented as knee injuries, shoulder injuries, foot and ankle injuries, and other injuries. Knee injuries segment is estimated to register the largest share of the global market and is likely to grow at the highest CAGR during the forecast period. This can be attributed to the increasing public participation in sports and athletic activities, increasing awareness, and the benefits of artificial tendons and ligaments. Increasing incidence of sports injuries and a growing number of initiatives to increase awareness about artificial tendons and ligaments coupled with increasing number of research activities on artificial tendons and ligaments are the major driving factors of artificial tendons and ligaments market. However, reluctance to use artificial tendons and ligaments among healthcare providers and high procedure costs and unfavorable reimbursement scenario across major markets may hinder the growth of the artificial tendons and ligaments market. The regional segmentation includes the current and forecast demand for North America, Europe, Asia Pacific, Latin America, and the Middle East and Africa which is further divided into major countries, including the U.S., Germany, France, the UK, China, Japan, India, and Brazil. The report includes the demand for artificial tendons and ligaments market based on individual segments in all the regions and countries. The report also includes detailed profiles of end players such as LARS, Neoligaments, Orthomed S.A.S., Cousin Biotech, FX Solutions, Arthrex, Inc., Shanghai PINE&POWER Biotech, Mathys AG Bettlach, Arthocare, and FH Orthopedics, among others.